In some of the components you need to define a sort key. Like a group key, this sort key can also be defined by selecting key fields using the Edit key dialog. There you can also choose what sort order should be used for each of the selected fields. Unlike in the case of a group key, in any sort key the order in which the fields are selected is of importance. In every sort key, the field at the top has the highest sorting priority. Then the sorting priority descends down from top. The field at the bottom has the lowest sorting priority. When you click the OK button, the selected fields will turn to a sequence of the same field names and an a or d letter in parentheses (with the meaning: ascending or descending, respectively) separated by a semicolon. It can look like this: FieldM(a);...FieldN(d). As you can see, in this kind of key, the sort order is expressed separately for each key field (either Ascending or Descending). The default sort order is Ascending. The default sort order can also be changed in the Order column of the Key parts pane. 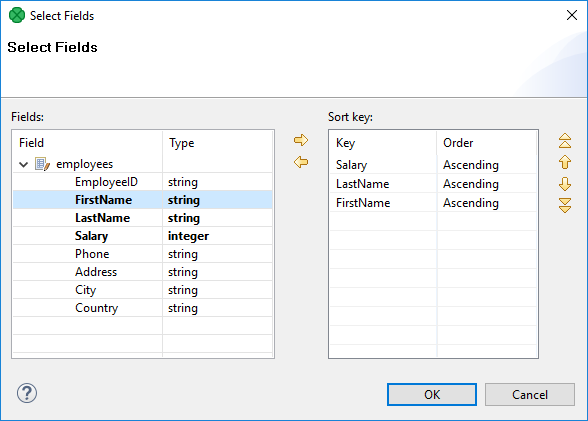 Remember that string data fields are sorted in ASCII order (0,1,11,12,2,21,22 ... A,B,C,D ... a,b,c,d,e,f ...) while the other data type fields in the alphabetical order (0,1,2,11,12,21,22 ... A,a,B,b,C,c,D,d ...). If your sort key is the following: Salary(d);LastName(a);FirstName(a). The records will be sorted according to the Salary values in descending order, then the records will be sorted according to LastName within the same Salary value and they will be sorted according to FirstName within the same LastName and the same Salary (both in ascending order) value. Thus, any person with Salary of 25000 will be processed after any other person with a salary of 28000. And, within the same Salary, any Brown will be processed before any Smith. And again, within the same salary, any John Smith will be processed before any Peter Smith. The highest priority is Salary, the lowest is FirstName.